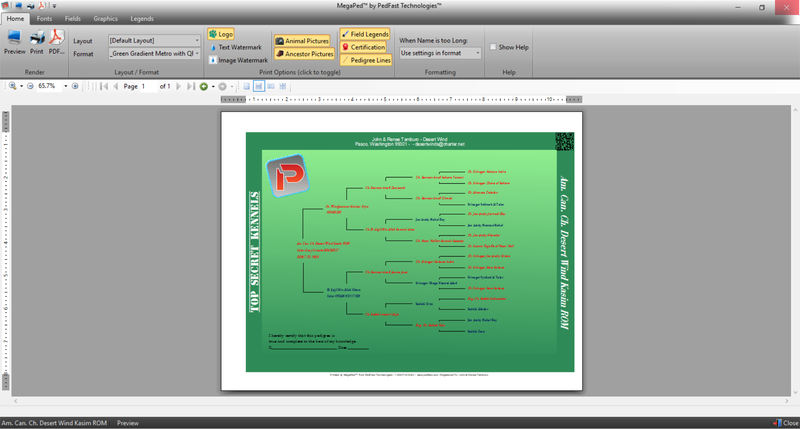 PedFast Technologies™ software products have been known for over 26 years for the best-looking pedigrees. Fifteen years ago, we introduced the first version of the only program that lets you design pedigrees for our programs to create and print: Pedcasso™. Now, with a new generation of pedigree programs, we introduce a new generation of Pedcasso™. · All of our future programs that are announced as Pedcasso compatible. Pedcasso™ is sold as an add-on program, and requires that you have one of the programs listed above in order to use it . Please note that Pedcasso does not work with the .NET (online) editions of our programs. Any version number ending in at least 2940, 3940 or 4940 (depending on your program) is compatible with Pedcasso™ 2019. If your program is on a lower patch number, simply allow AutoUpdate™ III to update you and you will work seamlessly with Pedcasso™ 2019. You can “clone” any of the pedigree formats to which you are licensed, and modify that clone to your heart’s content. And boy, have we given you unparalleled power to create new and gorgeous pedigrees, with things that the “competition” can’t even imagine! Pedcasso™ 2019 sports an extremely easy user interface, designed to operate quickly, after a very short install. You pick the format you wish to change or clone, and click the button, and you are working on that format. Pedcasso automatically installs new formats into The Breeder's Standard or the Cattery's Standard. Pedcasso™ gives you a window to make your changes or adjustments. You can change the size and position of any field, you can add special fields, change colors and other attributes. 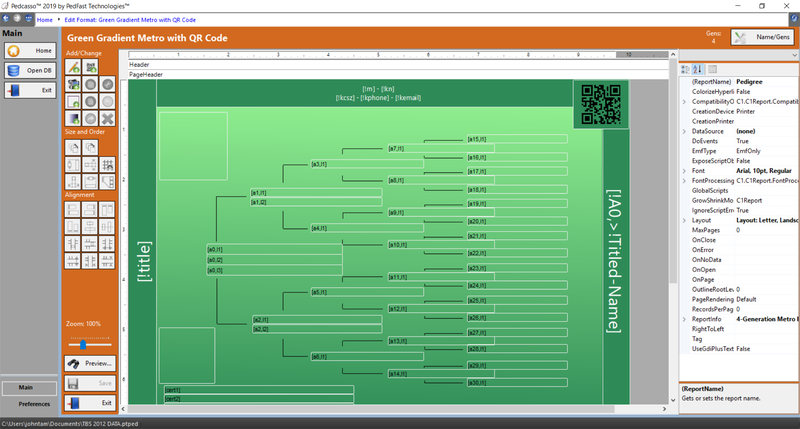 After you're done making adjustments to the fields, preview the pedigree layout with one click. Print it if you want! Pedcasso will show you what the layout will look like on paper. What you see is what you get. Powerful sizing and alignment: Take many items and make them the same size, space them as you choose, and line them up perfectly. Up to Ten Generations: Create pedigrees of up to ten generations in size. QR Codes: Place a QR Code on the pedigree that points to your breeding establishment's web site or to the animal's web site or any other page. Hand out a pedigree that lets anyone with a mobile device scan the code and go straight to your page. 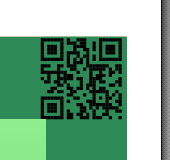 The Pedigree above has this QR Code in its upper right corner. Scan it and see! 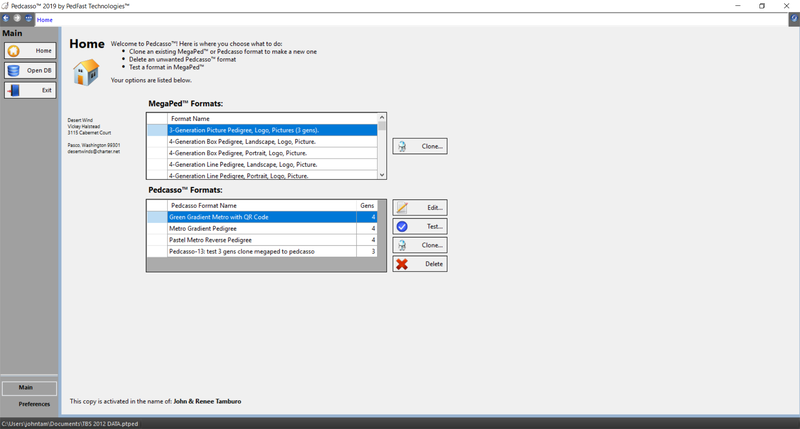 Prompted Fields: To add fields to a pedigree, Pedcasso™ 2019 takes away the "type in the code" stuff and replaces it with prompts so that you can do productive work by filling in the form. Of course, if you prefer to type in the information, Pedcasso will work beautifully for you! 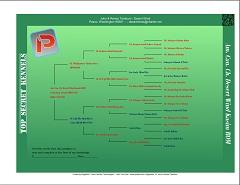 Pedcasso™ 2019 makes it easy for you to test your pedigree format. Click the "Test" button to open the selected format in MegaPed, for any animal in your database. Pedcasso™ 2019 enables to you choose any paper size, even custom sizes, with great ease. Pedcasso™ costs only US$39.99 plus S&H if a backup CD or USB is ordered. If you choose electronic delivery. Can I try this out without messing up my database? Pedcasso™ 2019, both free trial and full version, can open the same database as your programs, and they can reopen it without difficulty, as long as the programs are fully updated with the free patches. Will my Pedigree Power Packs 2.0 be able to be cloned? Not with the free trial of Pedcasso, but yes once you have paid. Can I share the Pedcasso formats I make with others? Not at this time. Soon, Pedcasso Pro™ will be available (at a higher price), and it will be able to export your Pedcasso™ 2019 formats (not derived from Pedigree Power Pack formats) that you can give away or sell to your friends. I want a free upgrade! If you purchased Pedcasso on or after January 1, 2018, you are automatically eligible for a free upgrade to Pedcasso 2019 and will receive a free upgrade order before June 8, 2018. I am not eligible for a free upgrade, so how much is Pedcasso™ 2019? If you are upgrading from the previous PEdcasso, the cost is $19.99 (plus sales tax in Illinois), and if you are purchasing Pedcasso for the first time, the cost is $99.99. If you want the software on CD or USB, there will be a charge for the media, plus S&H, added to the order, that varies by country. Pedcasso™ 2019 gives you the power you deserve, at a very affordable price. Make your pedigree a statement of your excellence, with our excellent tool. Pedcasso is here and available for immediate delivery. Click here to order Pedcasso™ now! Click Here to download a free trial of Pedcasso™ 2019! PedFast Technologies™ - We deliver what others cannot even imagine.